Note the very distinctive bill and blue-grey head. From a distance the King Eider can look very similar to the Common Eider, however the upper wings have less white and the head lacks the black cap. The King Eider is also smaller than the Common Eider. 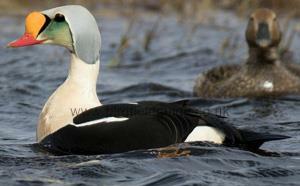 The Male King Eider in Winter has a black back and flanks with a large white patch near the tail. It's breast is pink or white and the head is a blue-grey colour. The King Eiders bill is pink with a large distinctive orange knob at the base. Rare and local breeder in Northern Iceland and extreme North of Scandinavia. Rare vagrant in the UK, most often seen in the North sea with Common Eider. The King Eider is a marine bird venturing into rocky low lying grassy bays where the Female sits in the open on her nest relying on her excellent camouflage to remain unseen. 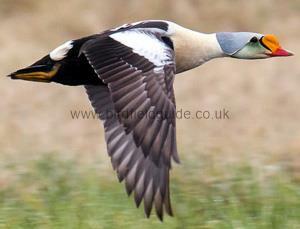 The UK is far south of the King Eider's range, however single birds can appear, often in the company of Common Eider. These vagrant birds can stay for long periods. The Male King Eider in Winter is unlikely to be confused with other birds, mainly due to the unique bill form and colour. Male King Eider in Winter plumage with Common Eider for comparison. 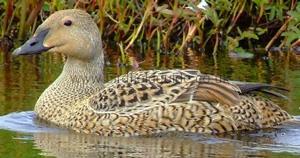 The Female King Eider is a brown bird with a distinctive barred feather pattern on her back and flanks. The Female has a small bill and lacks the white wing patches of the Male. The Female King Eider can be confused with the Common Female Eider; however, she is smaller, the bill is also much smaller and she has a distinctive feather pattern on her back and flanks. The back of the Female King Eider can look lumpy due to protruding feathers and the bill is dark. The Male King Eider in Summer is a much darker, browner bird. The bill knob shrinks and becomes less prominent, however it is still orange and pink helping to confirm identity. In flight the Male still has white wing patches.